Via Rolling Stone: Phil Spector ended up at Cocaran, in its Substance Abuse and Treatment Facility. Charles Manson is at the prison in Cocaran. Apparently the proximity generated a creative spark: According to the New York Post’s Page Six, Manson reached out to the “Wall of Sound” producer seeking a behind-bars musical meet-up. Is Phil Spector Really Tweeting From Jail? Update: The tweets are a fake, the author confesses and is going to stop. Phil Spector was sentenced to 19 years to life today for the death of Lana Clarkson. Attorney Doron Weinberg maintained that Spector was convicted wrongly. “The evidence did not establish Mr. Spector’s guilt beyond a reasonable doubt,” the lawyer said. The sentence included 15 years for second-degree murder, with a four year enhancement for gun possession. He showed no emotion during the sentencing. Update: Phil Spector has been convicted of second degree murder . The Judge refused bail pending sentencing. He faces at least 15 years in prison. More here -- and on the rise and fall of Phil Spector here. You can watch the jury verdict here. As the Guardian puts it, at 68, Spector is likely to die in prison. Update: Judge has canceled deliberations for remainder of the week due to a juror's illness. 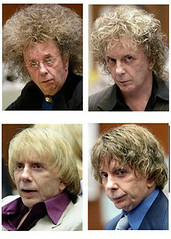 After a few court holidays and a juror's illness, the Phil Spector jury is back to deliberating his fate. This time around, they have the choice of the lesser charge of involuntary manslaughter, which carries up to four years in prison. LA Weekly reporter Steven Mikulan has been writing really good articles on the case. His latest, Accidental Suicide? New Involuntary-Manslaughter Option in Phil Spector Murder Retrial, goes through the closing arguments in detail. This time around, the jury has the option of involuntary manslaughter as a lesser included offense, which carries up to four years. Update: No verdict today, the jury will resume deliberations Monday. Here's how to blow a five month trial out of a judge's desire to avoid a deadlocked jury: Let the jury deliberate a week and then change the jury instructions to add new ways the jury can find the defendant guilty. Then, suggest to the jury they change their method of deliberations. ...in order to convict Spector of second-degree murder the jury had to find that "the defendant must have committed an act that caused the death of Lana Clarkson." It went on to specify the act was pointing a gun at her, which resulted in the gun entering her mouth while in Spector's hand. Fidler told the panel that to prove Spector guilty, "the people must prove that ... the defendant committed an act with a firearm that caused the death of Lana Clarkson, such as placing a gun in her mouth or forcing her to place the gun in her mouth at which time it discharged, pointing the gun at or against her head at which time it entered her mouth and discharged, pointing the gun at her to prevent her from leaving the house, causing a struggle which resulted in the gun entering her mouth and discharging. 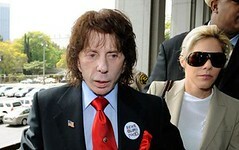 I can't understand the Judge in the Phil Spector case. Yes, if you're a prosecutor or a judge, it's a drag to try a case for five months and get a hung jury. But when the jury is deadlocked, you don't get a do-over on the charges or the instructions just to force a verdict. That's a recipe for reversal, in my opinion. Yesterday, the Judge said he was contemplating allowing the jury to consider a lesser charge to solve the impasse. At least a good night's sleep cured him of that. But today, while deciding against allowing the jury to consider a lesser charge, he decided to modify a critical jury instruction by striking a central statement from it. To make up for any prejudice, he said he'll allow the attorneys to present additional closing arguments. As the LA Times characterizes it, he "threw the prosecutors a life preserver." The Judge is hearing arguments this afternoon as to what to do. I think he should declare a mistrial. One thing he shouldn't do, as apparently he's contemplating, is give the jury a lesser charge to consider at this late date. The parties agreed to only submit the murder charge. The Judge endorsed that decision. Superior Court Judge Larry Paul Fidler told attorneys Wednesday he pondered whether there could be "lesser included offenses," which might allow the jury to consider voluntary or involuntary manslaughter rather than murder. "I don't see it," he concluded. Both the prosecution and defense agreed that the legal definitions of lesser crimes do not fit this case. The parties relied on there only being a murder charge in composing and delivering their closing arguments. To allow the jury to consider a charge neither side had the opportunity to address and argue would be manifestly unfair in my view. The Judge should declare a mistrial. Phil Spector's five month jury trial is coming to a close. The jury began deliberating the murder case yesterday. In the afternoon, they asked to see the gun. It's been a rocky trial. One of his chief lawyers, New York's Bruce Cutler, missed weeks of the trial to do a tv show and then withdrew before closing arguments over differences in who should preent the closing. Opening arguments are underway in the Phil Spector murder trial. The LA Times is providing updates from the courtroom, blog-style. You can watch the trial live on the internet (for a fee) at Court TV's extra. There are nine women and three women on the jury. Testimony begins tomorrow.